The wind was gentle but upon the breeze the natural music was still chaotic to a novice like Amber. Something like voices mixed in with one another as the breeze shifted around her, soft like sighing but chaotic just the same. The scents changed too, little pockets that burst into her senses. Pictures formed in her mind, spirit images that danced around her subconscious. She trembled lightly, biting back fear of the unknown. Something was trying to get her attention. He made a face of concern, his voice coming to her mentally, "One of the spirits is attempting to speak to you directly, that is rare for your level of experience. Relax.. and focus, draw its voice from the noise." He attempted to do the same, trying to pull the presence to her while sustaining his other efforts. Amber stopped trembling, letting her natural defenses go. She wanted to allow the voice in because the message was important. There was gentle singing on the breeze now, the wind caressing her body. Everything seemed to stop, there was no noise around her. Amber felt the hair on the back of her neck rise a little and she quashed down those emotions too. A voice sighed into her ear as the dancing images flooded into her mind all at once after given the chance. It was a young woman, who opened her blue eyes to look at Amber in return. Her hair was braided and pinned up close to her head, not left loose and long. Her skin was dark and tanned, as if she spent long days in the wild. Her body was taut and lean, common for one who knew the path of war. She had a message. The woman sang the same words over and over, in a dialect that had faded with the passage of time. Her voice was strong and rich and confident. It was a song that told Amber to stay strong, that she should follow her heart. She held promise that the life that Amber wanted for herself was possible. Her image spoke for itself in that regard. Something was coming that would shake the Broken Fang and change her people’s fate forever. Amber would have to look inside herself to save her people. The spirit too had a song for the shaman. She sang that he was on the right path, that he would be needed now more than ever before. To keep listening to the spirits. They would guide him on what to do. Asher appreciated the message, thanking the spirit with all the effort he could muster. He suddenly pulled his hands back from Amber, and the spirit world vanished from her senses. He was breathing somewhat heavily from the exertion when he looked up to her, "Listening is the first stage.. as you learn you will be able to see, and finally feel everything in that world. And doing those things without my help.. is the first step." "A grim message.. the spirits are not often wrong." He clasped his hands together and looked down at them in thought. "I was not expecting a message.. you must be marked.." He spoke almost absent-mindedly. She felt herself sad when the woman’s visage faded, that song fading as the wind swept across the plain. Amber’s eyes shone with emotions. She had been privileged to be visited by a spirit on her very first attempt. And the message made her happy, gave her peace. “Marked?” She frowned a little, becoming aware of her surroundings again. He nodded, "It means you can embrace the spirit world better than others, there is some importance tied to you being able to communicate with that plane, so the spirits ensure you will be able to." He shrugged slightly, "What that importance is.. I cannot tell you, but it is intertwined with your fate." “I’m glad,” she smiled at him. She wanted to see others like that woman again. His words made her feel special, while others wanted nothing for her to be mundane. She looked over towards the village. There was some sort of commotion going on. The emotions emanating from the village made him go alert, he stood and started walking towards the village. "Something is.." He looked back to Amber as he continued walking. He slowly walked into the village, glancing around for the cause of the disturbance, he didn't expect anyone would be desperate for his help. She slid off the rock and started running after him. The shouting could be heard even as far as the field. She wondered if it had to do with the Eikem. If something had happened to the scouting party. The warriors had indeed gathered together, Hotah the chieftan among them. Ahote was standing directly opposite Hotah, and words had passed between them. Amber slowed to a stop while looking at the men, she had never seen her father so angry, but they seemed oblivious to everything. The scouting party had returned with bad news and emotions were running high. The Eikem were indeed intending on seizing their tribal lands. The clan were split on two sides. Some were for fighting, others just wanted to get out of the Eikem’s way. Voices of panic rose among the tribe and it was all Hotah could do to keep his people calm. He told the women to gather their children and their possessions and accompany the elders to higher ground. The men would remain here to make preparations to drive the Eikem away. Asher walked up near the crowd around the chief, trying his best to listen in. If the Eikem were truly coming, they would be in trouble; he had a sinking feeling they were unprepared. He looked to Amber, wondering on her thoughts. He started to try to push his way towards the chief, he hoped the chief would allow him to bless their warriors to protect them from harmful magics that the enemy would no doubt be using. He approached him and knelt, holding his staff, "My chief.. allow me to try to protect our warriors from the harmful magics of the enemy." He raised his head, looking at Hotah. It would be a gamble, having him bless their warriors would take time, time they could spend on mustering more men or weapons. Ahote made a sound of disgust. “We don’t have time for this.” He started stalking away from the group, pushing past the crowd. His eyes paused on Amber. His brow darkened further and he reached out and grabbed her arm and pulled her with him forcefully to the outskirts of the village. There was so much commotion going on. “I belong to no one!” Her scream was lost when a loud crack sounded through the air. Then the ground started to shake beneath the villagers’ feet. Seeing Amber dragged away, he began to walk after her when the loud crack sounded. His head twisted around looking for the source. Not finding it, he dropped to his knees and planted his staff in the dirt, whispering quietly. He tried his best to counter-spell whatever might be happening, but there was an overwhelming force working against him. 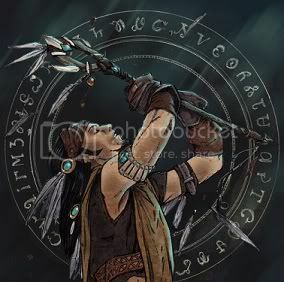 He ran to as many of the tribal warriors as he could, throwing concoctions and charms as quickly as he could, casting protective wards. It wouldn't completely protect them, but it would prevent most hexes. He stood with the warriors, preparing for whatever might meet them. Another crack and the trembling grew more intense, then more cracks becoming more frequent. The earth was tearing itself apart. Fissures began to spread underfoot before the earth completely gave way. Parts of the ground jutted up while others crumbled down. Screams were cut off as villagers fell into the ground, swallowed up by the heaving earth. No magic could have brought this upon the Broken Fang, it was the most massive earthquake shattering the winter ground that had happened in a very long time. Panic caused a body crushing stampede as villagers fled in every direction. But there was no where to run. Suddenly the earth gave way in a great divide. Part of the clan stood on one side and the other quite a distance away, their numbers greatly diminished all in a matter of moments. "Father!" Amber called across the chasm. She didn't know where anyone was, coughing in the dust kicked up from the earthquake. Asher and several of the warriors were thrown to the ground as the earth opened up, the ground peeling upwards. He scrambled back to his feet and started silently pleading with the earth spirits to aid them, but they had little desire to help so many unbelievers. His thoughts shifted to Amber, he glanced around but didn't see her in the immediate area. He strode calmly to the edge of the rift in the earth, standing on the edge overlooking the chasm. He gazed across, looking for Amber. She was his apprentice now, he would not abandon her. Amber called out again. “Father!” She paced as close to the chasm as she could. Women and children huddled behind the warriors left on her side. On the other her father shouted back to her, waving. Reality started to sink in and she looked into the chasm. So many lives had been lost. It gave her a bit of pleasure when she realized that Ahote was not among her side of survivors. But where was Asher? She was worried for her new friend. She shouted his name, looking around.